Three Star Trek Christmas ornaments from Hallmark are coming this summer, plus a Star Trek tabletop decoration due out this autumn. First up is Star Trek: The Motion Picture U.S.S. Enterprise NCC-1701 40th Anniversary Ornament With Light. This is the refit version of the Enterprise. The plastic tree ornament is lead-free and measures 2.5″ w x 1.32″ H x 5.7″ D. Cost for the U.S.S. Enterprise NCC-1701 ornament will be $32.99. Look for it in Hallmark stores on July 13. Next up is the Star Trek: Discovery Commander Saru and Michael Burnham Ornament With Sound. This ornament features dialogue from the Choose Your Pain episode of Star Trek: Discovery. The plastic ornament is lead-free and measures 2.75″ W x 5.31″ H x 2.5″ D. The cost for the Saru/Burnham ornament is $29.99 and it will also be available on July 13. The third ornament is the Star Trek Tribble Fabric Ornament With Sound and Motion. This ball of fuzz moves and trills when it is touched. 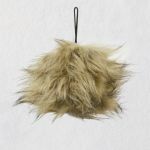 Made of fabric and lead-free, the Tribble Fabric Ornament measures 4.5″ W x 3.38″ H x 3.38″ D.
As with the other two ornaments, expect this on July 13. The cost for the Star Trek Tribble Fabric Ornament With Sound and Motion is $19.99. Finally, Hallmark is offering a Star Trek The Transporter Tabletop Decoration With Light and Sound. Created by Rodney Gentry, the decoration features Kirk, Spock, and McCoy, and it includes dialogue and sound effect set to a synchronized light show. To see the light show, connect the decoration to the included power adaptor. Look for this Transporter Tabletop Decoration on October 5. Cost for the tabletop decoration will be $99.99. To see the four Hallmark Trek ornaments and decoration, head to the link located here, where you can also see a video featuring the Transporter Tabletop Decoration.